Databricks released this image in November, 2016. The following release notes provide information about the Spark 2.0.2-db1 cluster image powered by Apache Spark. SPARK-18280 [CORE]: Fix potential deadlock in StandaloneSchedulerBackend.dead. SPARK-17703 [SQL]: Add unnamed version of addReferenceObj for minor objects. SPARK-18137 [SQL]: Fix RewriteDistinctAggregates UnresolvedException when a UDAF has a foldable TypeCheck. SPARK-17919 [R]: Make timeout to RBackend configurable in SparkR. 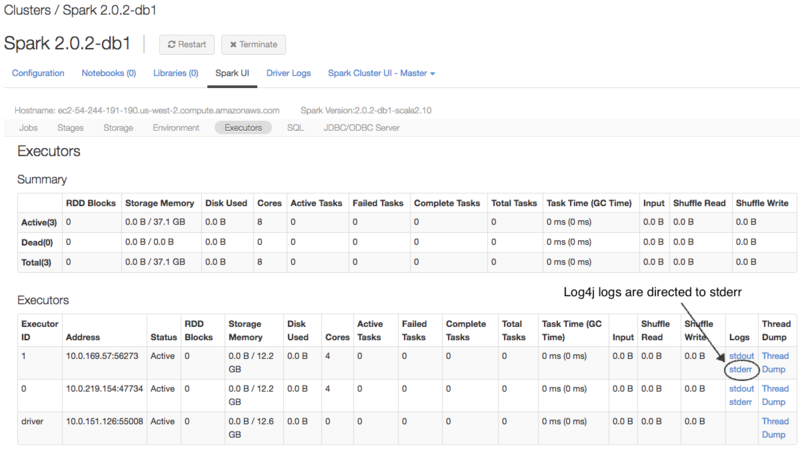 Starting from this version, users can enable Spark Session Isolation when creating clusters. With Spark Session Isolation, different notebooks attached to a cluster are in different sessions with isolated runtime configurations and current database setting. Operating system upgraded to Ubuntu 16.04.1 LTS from Ubuntu 15.10. Java upgraded to 1.8.0_111 from 1.8.0_66-internal. Python upgraded to 2.7.12 from 2.7.10. Most pre-installed Python libraries upgraded. Please refer to Pre-installed Python Libraries for the list of Python libraries and their versions. Performance improvement (better pipelining) on scanning files in S3. Performance improvement on queries using percentile_approx. Users can set spark.databricks.session.share to false to enable spark session isolation. With Spark Session Isolation, different notebooks attached to a cluster are in different sessions with isolated runtime configurations and current database setting. Please refer to the section of Spark Session Isolation for details. Databricks redirects executor Log4j logs to stderr. Users can access stderr on the executor page and every worker page of the cluster. Worker pages will not show the log4j link and executors will not write logs to log4j files.